I don't think the roof opens, Swashy. I think it's a natural light roof. If so, they should be able to grow grass. Just over 28k fixed seats with a potential capacity of 30k (smallest of all MLB stadiums). 16 MLB teams averaged over 28k fans per game last season. 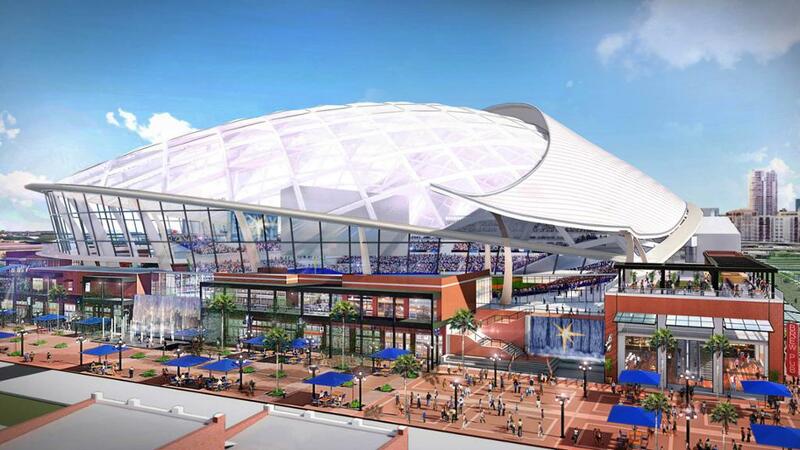 No upper-deck or retractable roof would save $ on the cost to build. Meh, lets get built and start filling it up every night before bitching about the seating capacity. I don't disagree, but cost to build it is a factor in getting this nightmare stadium issue over with. I can't be certain, but I'd imagine the architects have a plan for potential expansion. I agree 40k would be good capacity. There is no upperdeck in the current design so perhaps it's possible to add it after a few years. Is that a glass roof? Will MLB approve a stadium that maxes out at 30k? NYBF wrote: Is that a glass roof? I haven't read anything about the engineering of it, but why does that look like it's just going to be a big greenhouse? By appearance, it will be 140 degrees in there by 11:00 a.m.
And what's that gimmick behind home plate, second tier? Is that open to the outside, like some big indoor/outdoor porch? NYBF wrote: Will MLB approve a stadium that maxes out at 30k? $900 million to build a stadium that holds no one? Roof doesn’t appear to be glass. Just the back wall of windows. Looks fine to me. I’ll enjoy games there. Don’t give a **** about capacity right now. Not like we’re busting at the seams in the Trop. I think smaller seating capacities will become the new normal as new stadiums are built. Especially in markets with a majority of fair weather fans. I can't see big market owners, who are the source of revenue sharing income for small market teams, will approve building a stadium with such a small capacity without some sort of revenue sharing relief. NYBF wrote: I can't see big market owners, who are the source of revenue sharing income for small market teams, will approve building a stadium with such a small capacity without some sort of revenue sharing relief. There are handful of MLB parks whose capacity are in the 35-40k range including he Marlins recently opened stadium. So this plan for the Rays is only 5k off of that. I'd be interested to understand the potential for expanding the seating capacity (adding an upperdeck, more outfield seats, etc). I'm fine with current plans and keeping the initial construction costs down so this thing can get built. Once that happens and we're filling the new park up for a couple years we can complain about additional capacity, but it seems like a nice problem to have at this point given the current situation. The smallest stadium (non-Tampa division) is 35k. With 28k fixed seats, the proposed Tampa park is 20% smaller than that. That is a huge difference. The Rays have been averaging just 14,745 attendance. This stadium will seat twice that with standing room up to 30K. It will have see-through sliding glass walls, a fixed translucent roof, an artificial turf playing field and will be integrated into the historic Latin neighborhood with an evolving design. A smaller capacity-stadium fits into the new sports trend of maximizing premium seating areas with gathering spots around the stadium. Tropicana Field, in its latest configuration with upper seats tarped, has a capacity of 31,042. And it’s not like the Rays have been filling up the place, averaging, through Monday, 14,745 per game, second lowest in the majors. I do too. Its very different. Who’s Going to pay for it? I remember the old tbtimes.com site whenever a story about a new stadium was written for every “I can’t wait” comment there was probably 10 “Not with a penny of my tax dollars!” comment. nhbucsfan wrote: Who’s Going to pay for it? I remember the old tbtimes.com site whenever a story about a new stadium was written for every “I can’t wait” comment there was probably 10 “Not with a penny of my tax dollars!” comment. That's going to be the fun part of these stadium talks. Everyone loves the idea of a shiny new stadium but nobody will want to pay for it. Whatever they do, they don't have much time to figure it out. The Rays only have until January to be able to negotiate out of their St. Pete deal. Miss that deadline and they're stuck in St. Pete until Stu moves the team in a couple years. Ill give two penny’s of my check. Boom. Wasn't this supposed to be a terrible Rays team? If Tampa wants the Rays to play in Tampa, then Tampa should pony up the majority of the cash. Otherwise, stfu and let them stay in St. Pete or go to some other city that's willing to buy them a stadium once their contract is up at Tropicana. It's really that simple. Richmond Rays has a nice ring to it.